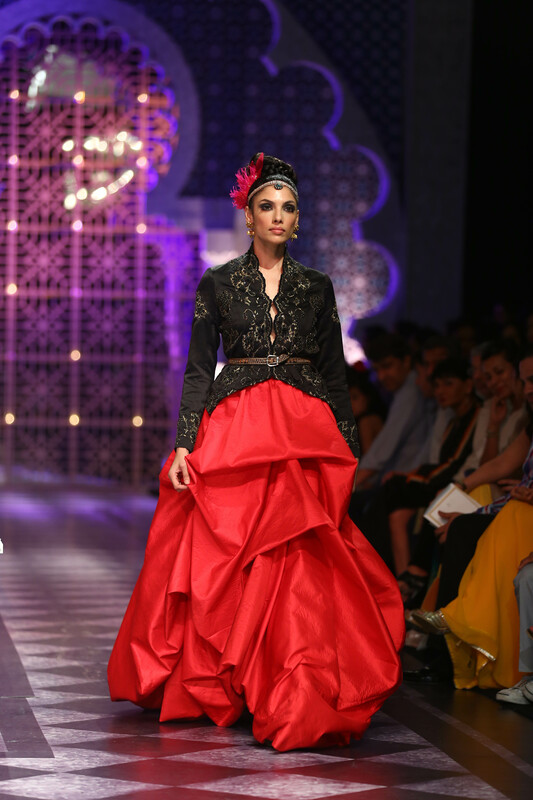 For many who missed Raghavendra Rathore’s creations on the ramp would have rejoiced as he made a comeback after four long years. His work this time around reflected quite a futuristic approach as he showcased future bridal wear highlighting the concept of people traveling across the globe for a wedding. 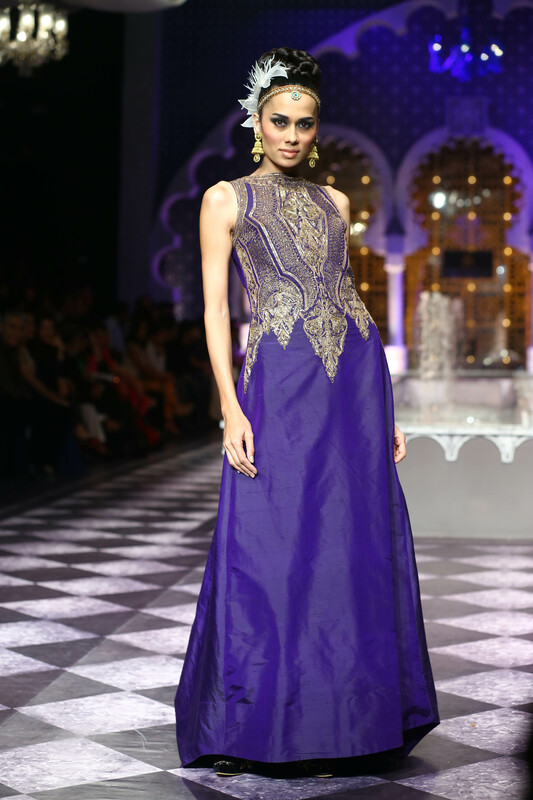 When it is Raghuvendra, everything has to be royal and classy.This collection also drew its inspiration from traditional silhouettes across Asia. 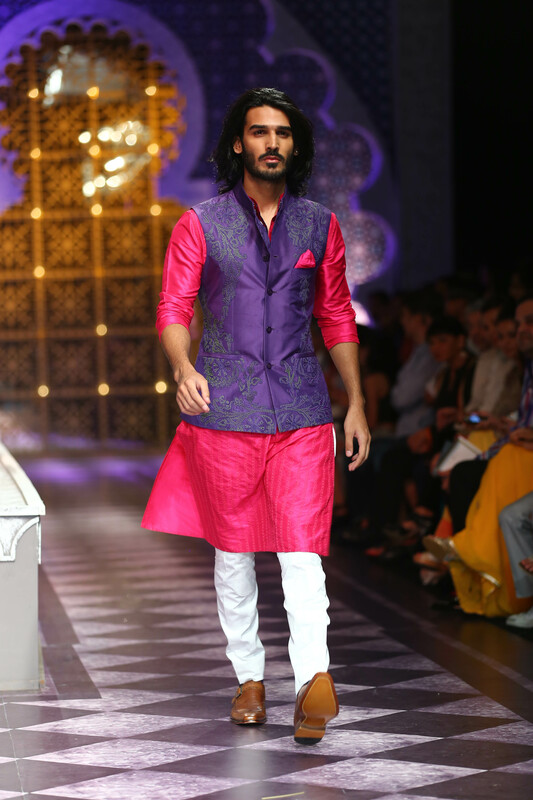 When a veteran is participating, there is much buzz to see their patent styles.He showcased his trademark jodhpuri bundgala jackets, not only as a part of men’s collection but also was inspired by the same to present the bolero bandgala and sari bandhgala in his women’s collection. 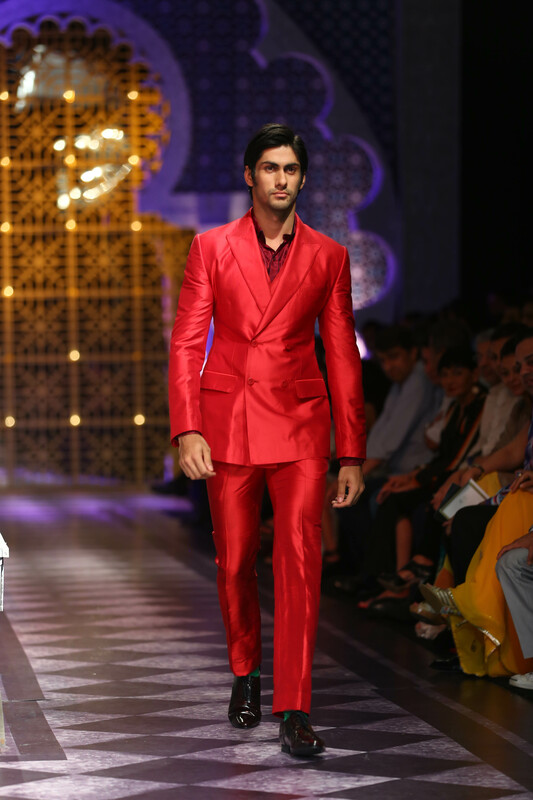 The men’s wear was rather attractive and dapper encompassing velvet coats in the hues of red and green with pocket squares, men suits in all vibrant colours like pink, purple, navy blue, red, turquoise blue, and not to forget the silk blue suit with bandhgala with a complementing hot pink pocket square. Sigh! Thank God, we saw minimum of the mundane shades of grey, black and brown . The women’s range showed a plentiful of eye-catching details whether in frilled gowns, long robe like embroidered jackets or shrugs in velvet. 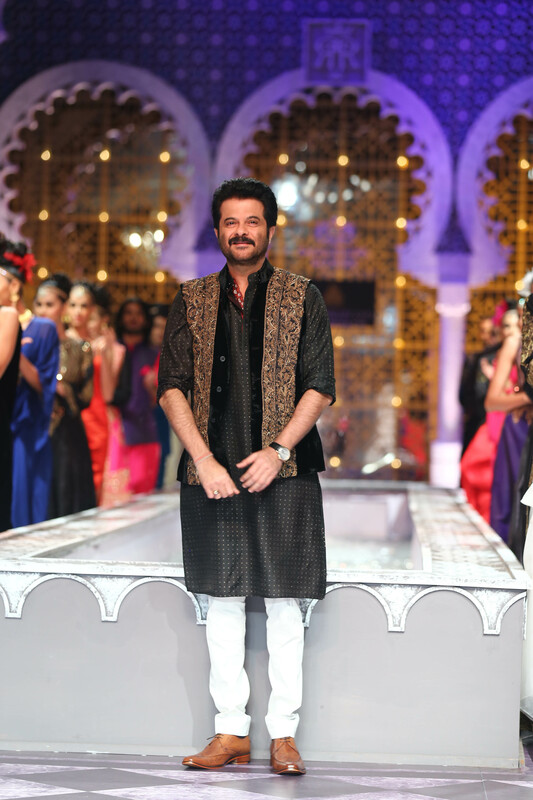 At closure, Anil Kapoor took everyone by surprise with his sleeveless velvet jacket teamed up with a black kurta. 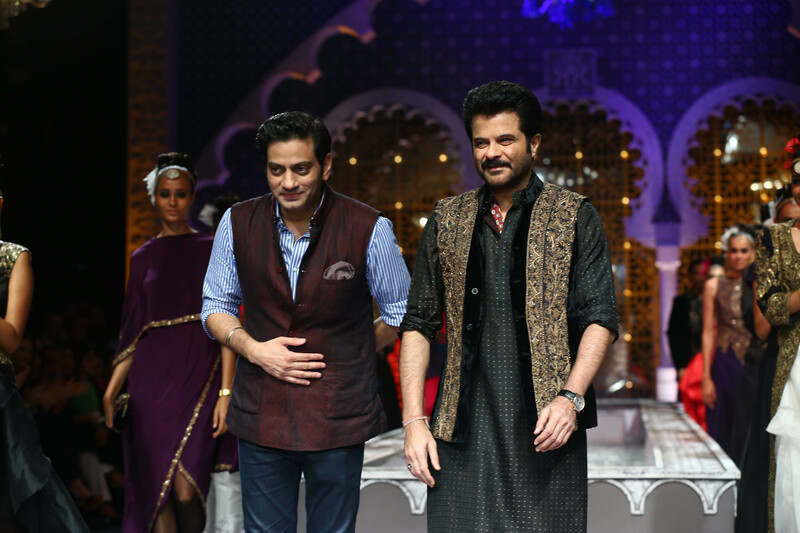 This entry was posted in Uncategorized and tagged Anil Kapoor, Bollywood, Bridal, Celebrities, Delhi Fashion Week, IBFW, India Bridal Fashion Week, Indian Fashion, Lehenga, Models, Raghavendra Rathore, Sari, Sherwanis, Wedding. Bookmark the permalink. We could not agree less.. Cheers! !